If you watched the first Democratic debate, you now know that the preferred label for Democratic candidates is no longer liberal, but progressive. They all used the term to describe themselves and seemed to revel in it. To be progressive sounds like you’re all about progress. What do you want to progress toward? Since progress entails moving away from the past, which aspects of the past are you jettisoning? I found a passage in the Bible that indicates that being progressive is actually regressive. Progressives believe government, especially Big Government, is a positive source for good, the US Constitution is antiquated, and the Feds should control the states. Big Government is God (the greatest force for good) in the progressive world. Most historians say that modern progressivism gained favor as an ideology between the 1890s and 1920s as both Democrats and Republicans, especially Woodrow Wilson and Teddy Roosevelt, pursued political, and economic reforms, as well as visions of world peace. Chief among these aims was the pursuit of trustbusting (breaking up very large monopolies), support for labor unions, public health programs, environmental conservation, and promotion of world government (beginning with the League of Nations and eventually the United Nations). Ponder that last line in italics. It describes the worldview battle we’re currently facing. But we need to go further back in history to give progressivism its proper place. For the past three hundred years. two philosophies of man, government, and salvation have been at war in the Western world. Let’s call one the biblical view of life and the other, the secular view of reality. The biblical view teaches there is a Creator God whose kingdom rules the universe. God placed man on earth to steward and develop it, but mankind fell through sin from God’s original purposes. God brought salvation through Jesus Christ which human beings can accept by faith. Born again believers are empowered by the Holy Spirit to transform the nations of the earth through godly character, biblical principles in society, just laws, compassion and generosity, and limited government. Biblical principles of morality, family, government, economics, justice, compassion, and peace through strength is what created the blessings of the West world over the past centuries. The Revolutionary War was fought to establish the biblical worldview in the New World. Exhibit A is American exceptionalism–a godly, free, and prosperous nation greater than any in history. The secular view of life teaches that there is no God, no moral absolutes, and that human beings are on Planet Earth by accident due to billions of years of evolution. Without God and any of his principles to guide us, secularists believe that strong-men and governments must arise to “save” the human race and create peace on a global scale. The French Revolution is an example a secular-progressive triumph. Violent men overthrew the governing powers, killed the followers of God, and filled the nation with rivers of blood. They established a secular dictatorship to guide the ignorant masses into future “progress.” God was out; Morals and family were passe, and a new man-made Utopia was envisoned. Fortunately, that “progressive” revolution died and the American one succeeded. Since that time, other forms of man-made progressive salvation have been tried in other parts of the world under the names of socialism, fascism and communism–to name a few. They all have the same basic worldview, but only differ on the power means to get there. Those secular “isms” of the 20th century killed hundreds of millions of people. How’s that for progress? By any fair standard that’s tyrannical and regressive. So, since progressivism entails moving away from the past, which aspects of the past do current day progressives want us to get rid of? 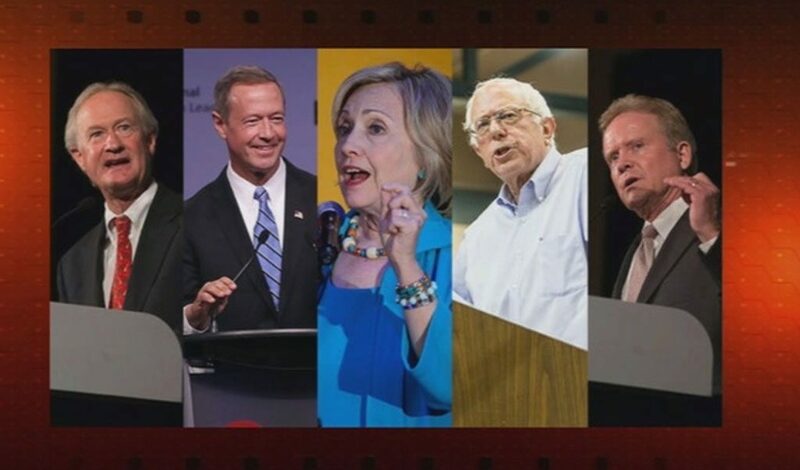 God – You’ll notice that any discussion of God and his principles was noticable absent from the CNN Democratic debate. To be honest, Hillary Clinton mentioned a couple of times our “God-given talents.” Nobody else dared to mention the God-word. That’s consistent with the secular agenda of ridding God from the schools, from the public square, and targeting everything Chrisian in the USA. It’s been building for years. But if the progressives have their way, the persecution of faith will increase astronomically. The nuclear family of a mom, dad, and children. The sexual revolution, no fault divorce, and changing the definition of marriage have all been tactics to break the strength of the biblical family, with devastating results to family life in our nation. Freedom in economic life and godly human rights. Since progressivism is about Big Government controlling many aspects of life, its ultimate fruit is tyranny and the loss of liberty. As branches of the same tree, secularism grows the State, socialism creates crony favorites, fascism stirs up the power of mob rule, and communism takes away all freedom via the barrel of gun. But its all the same tree of Big Government power. Human responsibility and accountability is the bedrock of biblical faith. People must choose right or wrong, freedom or tyranny, work hard to succeed, and never live as victims through the power of Christ. Progressivism regresses those godly characteristics into government dependency, class warfare, victimhood, and all the fruits that laziness and blame bring. National strength into international absorption. One of the main aspirations of progressivism is the dissolving of national boundaries into a world government led by enlightened elites. This will be the ultimate expression of progressive power–A one world government that touts itself as the savior of mankind and its ills. Why are all these things regressive (going backwards)? Because most of them were in primitive form in the New World prior to the birth of America. For thousands of years the understanding of God was limited and distant on American soil. Many native tribes lived in constant war with their neighbors and even sacrificed their children to the gods of the land. True freedom and human rights were unknown. Biblical knowledge had never been applied to lift people out of poverty and conflict and into the blessings of freedom and civility. Chief-centered tribalism ruled the land creating misery, backwardness and lack of hope. Don’t believe the romantic allusions of the “Noble Savage” and peaceful features of pre-American life. They are myth, not reality. This was a tribal form of man-centered governance to which modern progressives want us to return in a modern-day technological form. Remember this: Secular, wordly, liberal, and progressive are all the same thing. They are simply different words that describe a rejection of God and his wise rules of living while pointing to man-made solutions that have always failed and created tyrannies. Backward not forward. That’s where the progressives are really taking us. Being progressive is actually regressive–just as trusting men is inferior to trusting God. True progress comes through following the ways of our Great Creator and Savior God in every aspect of our personal and corporate lives–not regressing to the cruel whims of fallen men.